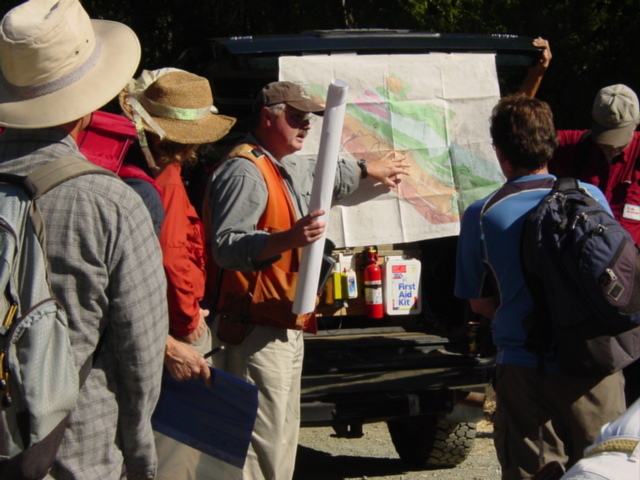 Several dozen NCGS members, spouses, and guests assembled on September 16, 2006, at the Sibley Volcanic Preserve in Oakland’s East Bay Hills to participate in a demonstration of computer-based mapping technology. 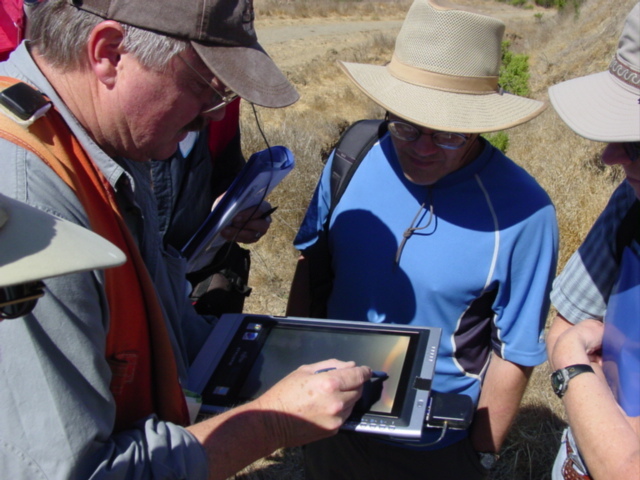 Digital Geological Mapping Methods was led by University of California Berkley professor George Brimhall and three of his graduate students. Dr. Brimhall advocates developing strong geologic field skills, which are slowly disappearing at the university level. Brimhall and his student docents used the local volcanic terrain to showcase mapping software that he has developed and markets through Rubicon Digital Mapping Associates. 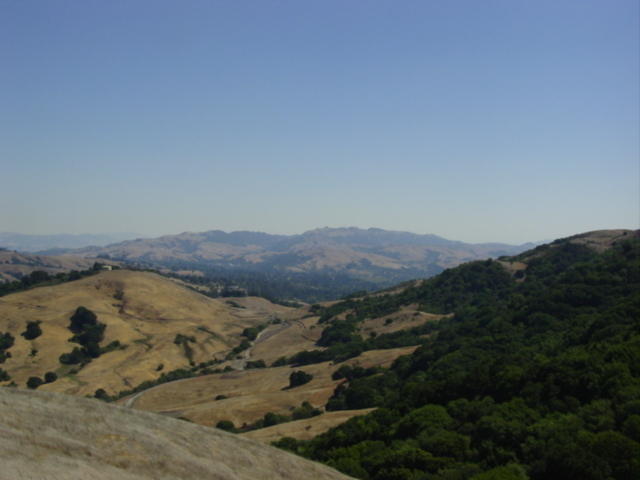 The Sibley Volcanic Preserve and geology of the East Bay Hills north of the Preserve have been well characterized by several generations of U.C. Berkeley field classes. Work began with A. C. Lawson’s field studies in the early 1900’s through Garniss Curtis’s detailed mapping, radioactive dating, and interpretive activities in the 1940’s through 1970’s. Curtis’s field classes provided structural detail and characterized many of the volcanic features exposed in this area. The Sibley Volcanic Preserve contains exposures of deep marine siliceous sediments and cherts of the mid to late Miocene Claremont (Monterey) Formation (c.a. 16 m.y. old), overlain by conglomerates, sandstones, and shales of the shallow marine to terrestrial upper Miocene Orinda Formation, This sequence represents a major regression and infilling of a pull-apart basin capped by the extrusive basalts and basaltic andesites of the Moraga Volcanics. The latter are exposed in the Sibley Preserve as flows and pyroclastics erupted from vents within the park. The Mio-Pliocene terrestrial Siesta Formation, with its lacustrine limestone member, overlies the Moraga Volcanics. These stratigraphic units are exposed in the Siesta syncline and the adjacent Glorietta anticline, formed by Pliocene deformation. Dr. Brimhall noted that volcanics in the northern Coast Range become younger to the north. This supports models that invoke a northward-migrating subducted triple junction as the driving force for pull-apart basin formation and magma generation. The Sibley Preserve eruptions occurred about 10 m.y. ago. Before describing the mapping technology, George graciously acknowledged former Chevron employee Chuck Ramsden’s generous estate donation to the U.C. Berkeley Earth and Planetary Science Department for undergraduate geological science development. This endowment allowed purchase of the powerful Fujitsu Stylistic laptop workstations that were specially designed by Fujitsu under Dr. Brimhall’s guidance. These high end portable units cost $2,100 each and sport spectacularly clear, readable screens, a real benefit for outdoor use. Laptop battery life is 8 hours. Add a GPS (global positioning satellite) card for $126 and the system is complete. The U.C. 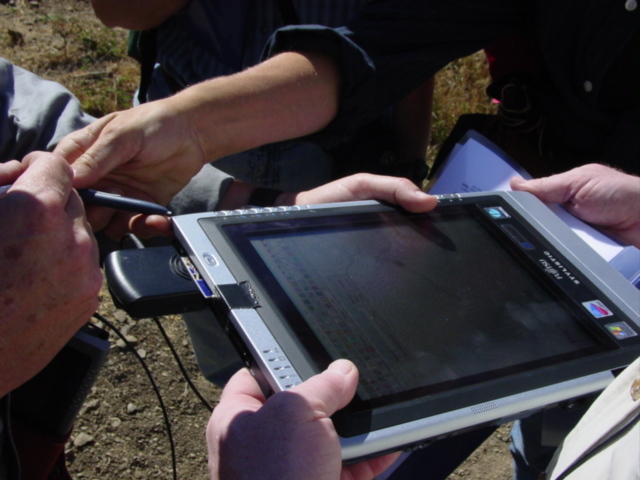 Berkeley laptops use a Trimble GPS system that is accurate to ±1 meter. Four satellite signals are needed to establish an accurate fix. The software package uses GeoMapper graphic user interface (GUI) developed by Dr. Brimhall. It resides on top of the PenMap software program sold by England’s Stratus Software. This combination offers a powerful, flexible digital field mapping tool. GeoMapper provides click-on button selections for a complete selection of symbols, patterns, and mapping tools that can be customized to specific lithologies and field conditions. The latter matches symbol patterns used in Robert R. Compton’s Manual of Field Geology. Orthoquads used for mapping can be downloaded from the USGS website. The software allows one to zoom in or out as necessary. The user can also determine what GPS satellites are triangulating on the current location. But Dr. Brimhall cautions that users should rely on the local topography as well as the GPS for locating themselves. The GeoMapper software can be configured to plot points on the map as one walks a contact. An UNDO icon allows the user to correct any errors. The AUTOSAVE function ensures that valuable data is not lost. GeoMapper is a graphic user interface (GUI) that resides on top of the Pen-mapper Stratus software designed in England. U.C. Berkeley gets the software for one-third cost ($700). It is a marvelous mapping combination. GeoMapper has a variety of toolbars available for custom field mapping conditions. One toolbar is available for sample labeling and collection site identification. Another toolbar addresses soil and water samples. And both require specimen labeling before the user can continue. 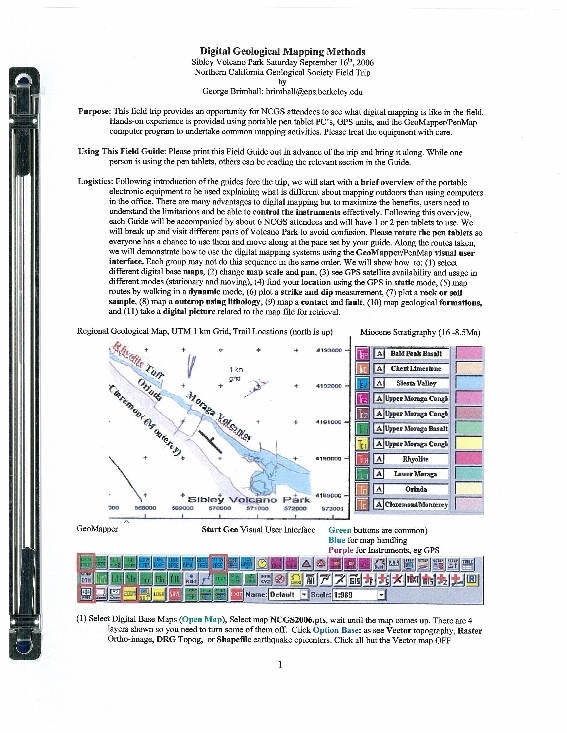 Other toolbars focus on the lithology and geologic structures. Toolbars for mining industries and mineral resources are also available. The Geotool Bar can even capture digital photo bitmaps and assign them to specific locations for presentations. This is a full GIS system capable of exporting a map file to a printer. The GIS provides base maps, user location, and what satellite signals are being accessed. Stereomaps can also be viewed using GeoMappper. Dr. Brimhall downloads his aerial photos to the laptop and then opens them with the software. After this introduction to the laptop and mapping software, the trip members were divided into groups and assigned to one of three graduate students for a short field exercise. Our guide, Kyle Brudvik, booted up the computer and software, then uploaded a topographic map of the Berkeley Hills and Sibley Regional Park. He enlarged the map ten times (zoom function) to provide a workable scale for our field mapping. Next he checked the GPS information, station zoning, and satellite reception. Kyle noted that one should ensure that several satellites are giving a reading on the location. One wants a very strong satellite signal to provide an accurate position reading. As our group went uphill away from the Sibley visitor center, the GSP signal became stronger. Hence, the physical terrain can influence GPS signal intensity. This may require selecting other satellites if a consistently weak signal is being received. The laptop keyboard is designed for easy use. The computer has several USB ports for downloading files and connecting to peripherals. Once on the trail, Kyle demonstrated the lithology toolbar. He selected the contact button then touched several spots on the laptop screen. The program immediately connected these points with straight lines. An appropriate reference point can then be selected and named for adding pertinent field information. During the demonstration Kyle commented that the “transflexive” laptop screen is quite visible in direct sunlight, and can be backlit in shady conditions or darkness. The laptop’s 14” by 9” size allows it to fit into a field jacket vest pocket. Its compactness is ideal for field studies in geology, archeology, or other natural sciences. Sampling surveys are especially adaptable to this portable system. 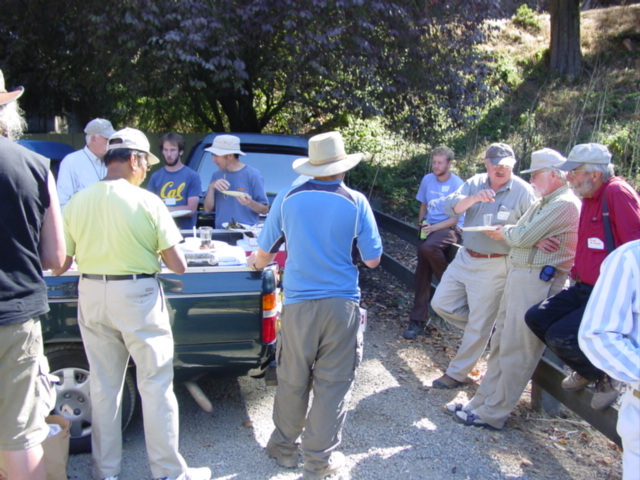 The group proceeded past a faulted contact between the Moraga Volcanics and the Orinda Formation, then stopped at a fault juxtaposing conglomerate over massive sandstone in the Orinda Formation. Here Kyle took strike and dip readings on the units and showed how to plot them on the digital map. Further down the path more strikes and dips were measured at the conglomerate-sandstone contact, and entered onto the map. Kyle continued to describe the various map plotting functions as the party walked into the amygdaloidal lower Moraga Volcanic units. 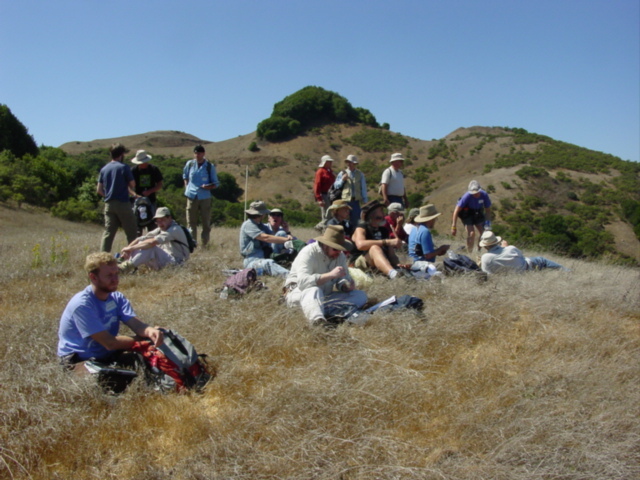 The group then headed east to take a short lunch break on a ridge that provided a spectacular view of Mount Diablo and Las Trampas Ridge to the south. After lunch, the field trip circled back to the park entrance, noting volcanic features of interest. 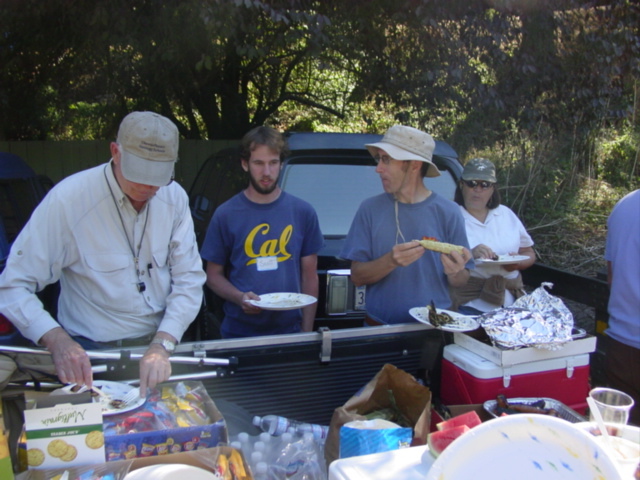 When everyone had assembled in the parking lot, a barbecue was set up, charcoal lit, and a delicious meal prepared by NCGS Field Trip coordinators Tridib Guha and Rob Nelson. The menu included marinated chicken, salmon, salads, and Tridib’s coveted baked bean medley. Over sodas and beer the members socialized as the chicken and fish cooked. Everyone enjoyed the food and friendship as the sun crept over the ridge in the late afternoon sky. All were impressed with the laptop and software package that Dr. Brimhall and his students had demonstrated that day. Many thanks to Dr. George Brimhall of the U.C. Berkeley Department of Earth and Planetary Sciences who graciously agreed to lead this field trip demonstrating his portable digital field mapping technology. The NCGS also wishes to acknowledge UCB graduate students Kyle Brudvik, Scott Orton, and Jonathan Perkins who accompanied the members in the field and demonstrated the laptop mapping systems. Tridib Guha deserves credit and accolades for another excellent field trip barbecue. He was helped by Mark and Karel Detterman, Phil Reed, and Dan Day. Dr. Brimhall merits further recognition for his continuing efforts to promote field skills in the geological sciences. Cost considerations are gradually eroding geological field programs across the United States. This decline in a vital Geoscience discipline is a major concern to both academic institutions and industry. For more information on his programs to restore field techniques to geological science curricula, contact Dr. Brimhall at brimhall@eps.berkeley.edu.